St. Marina’s Monastery is one of the most important pilgrimages in Greece. 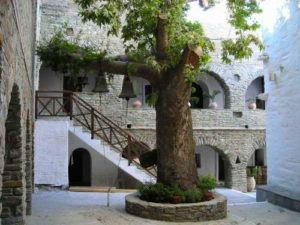 Dedicated to the Great Martyr of the 3rd century AD this holy place lies in the area of the village Apoikia in Andros. Its foundation dates back to 1325 AD. Saint Marina miraculously reveals herself to an elder monk with instructions about the position of her hidden religious icon on the slit of a rock. 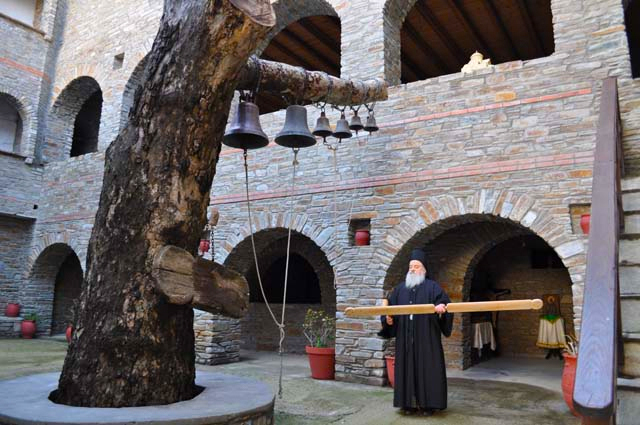 The monk with the financial support of emperor Emmanuel II Komnenos establishes the Holy St. Marina’s Monastery in Andros. During the 16th century, the St. Marina’s Monastery gets raids of pirates, resulting in burning three times and decaying. In 1743 it lost its glamour and houses only five elderly monks. By constant miracles and revelations, Ieronymos Sophronios arrives at the Monastery. He renovates it by selling all his property in the Peloponnese. In 1746 he converted it into a female monastery. In 1883 following a declaration of the Bavarian rulers, St. Marina’s Monastery force to close and turns into a barn. The religious icon of the Saint is protected in an auction by the Embirikos family and remains for 146 years at the church of Virgin Mary of Chora. In 1975, Metropolitan Dorotheos, crossing the ruins of the Monastery, begs his deacon to restore it. The former Monk of Mount Athos refuses. The same evening, however, the Saint appears in a vision telling him that herself and her sisters should return to live in the Monastery. From the very next day begins the latest restoration of the St. Marina’s Monastery in Andros. After a persistent effort by Kyprianos, the icon returned to the monastery in 1976. At the same time, the monk also discovers the holy water that Saint Marina has advised him in a vision while sleeping. Over the last decades, Saint Marina has performed many miracles, others are well-known, and others are not. The St. Marina’s Monastery in Andros celebrates on July 17, attracting a vast number of pilgrims.